I, Jedi on Michael A. Stackpolen kirjoittama ja Bantam Spectran julkaisema tähtien sota-romaani. Kirjan tarina sijoittuu aikaan juuri ennen Kevin J. Andersonin Jediakatemia trilogiaa. Corran Horn was an officer in the Corellian Security Force before casting his lot with the New Republic. As the grandson of a legendary Jedi hero, he has latent Force powers that have yet to be developed. But he has managed to distinguish himself with Rogue Squadron, the X-wing fighter force that has become the scourge of the Empire and of the pirates that prey on Republic shipping. When a new pirate band begins terrorizing the space lanes, Rogue Squadron seems at last to have met its match. Led by an ex-Moff in an Imperial-class Star Destroyer, the pirates appear uncannily aware of the squadron's plans and tactics, and are able to detect and escape even the cleverest ambushes. Either there is a security leak…or the pirates have access to a dark and unnatural power that only a trained Jedi could contend with. Then Corran's wife, Mirax, vanishes on a covert mission to locate the pirates' secret base, and Corran vows to find her. He begins Jedi training at the Jedi academy, hoping to develop his untapped powers. But as he grows dissatisfied with Luke Skywalker's methods, he will break with the academy before his training is finished. Calling on his Corellian undercover experience, he infiltrates the pirate organization. His plan is daring and dangerous. He will learn what he can, sabotage what he can, and use every means possible to find his wife. And his very survival may depend on a terrible choice—whether or not to surrender to the dark side. 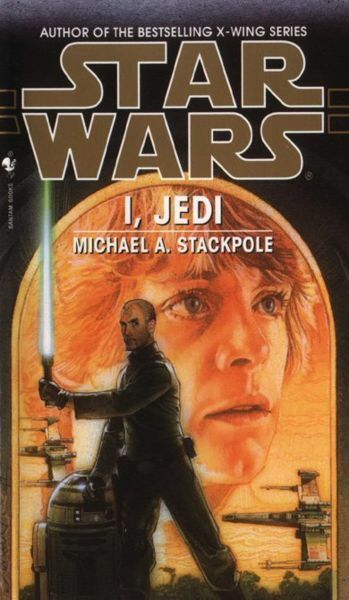 I, Jedi brings readers into the startling, dramatic journey of a young man with a wild talent who must somehow master those powers within…or be destroyed by them. Sivua on viimeksi muutettu 21. maaliskuuta 2019 kello 14.55.